Everyone at the Fremantle Sailing Club, the Customs and Agriculture people have all been very kind to me. I have been given clearance for three months in Australia with the ability to bring food on and off the boat for the length of my stay. It’s now 10:30 and I’ve been up since the day before yesterday. Having Claire here is wonderful, she’s a pleasure to be with. We had dinner at Alek and Maryanne’s which was delightful. They are truly fantastic people. With each new day comes more to think about. Tomorrow I will tackle some of the issues on my mind with a good nights sleep behind me and the support of many good friends. I am missing you madly. I will solve the problems as quickly as possible. Glenn from the wonderful set of photos posted after your arrival in Fremantle, you and West Wind II look fabulous! On close examination I see your carefully constructed 10 finger “quarantine flag”, jury rigged emergency shrouds and the missing wind generator head. But from your gleaming white boot top and sails to your Indian Ocean tan, you both look like you’ve just returned from a pleasant few days cruise!! 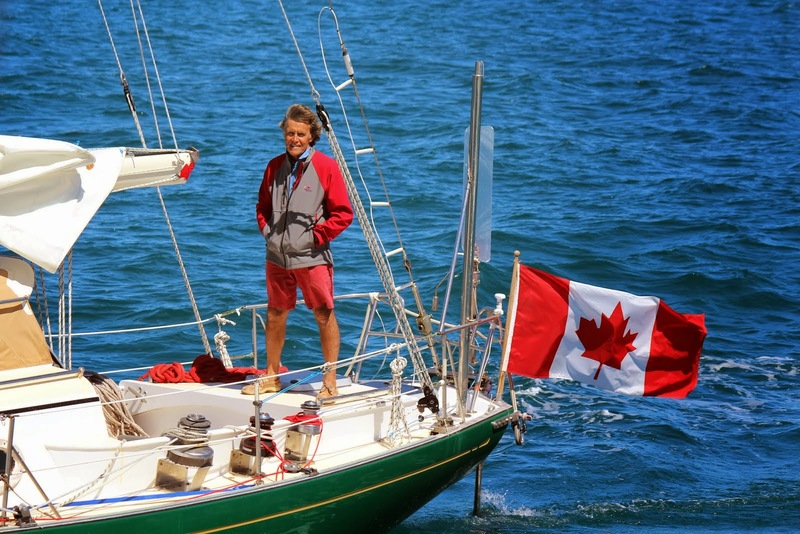 Congratulations on yet another demonstration of outstanding seamanship mate! Hoping all is going well in Australia, and hope you will be together soon. Have to say I miss the daily posts! Since our son Paul, Isobel and I arrived back from our fishing/hiking event last night, we have been catching up on your arrival news. Congratulations on completing that safely. And what a welcome with Alex and Maryanne, Ted and others there when you arrived. Then the very special moment it must have been when Claire came off the flight from Auckland. We’ve experienced her hugs; maybe she learned from you! After slightly over three months of daily radio contact with you Glenn, the evenings here are now strangely quiet. There were not many evenings when we did not connect with each other. If you are living on board and have a few minutes maybe we could still hook up via amateur radio again before you finally head for home. Meantime, all the best with sorting out the next phase in your great adventure. Good to have you back on shore, mate! Cheers Glenn and welcome back. Much to think about and to do. Charting the unknown is always tiring as you know. Hoping everything works out smoothly. Cheers to Marylou as well. Congratulations on your voyage and safe arrival. From the photos everything looks very ship shape.